Things get messy down in the Underhollow. The history of Dota is the history of ideas being poured into a giant bucket full of wizards. From Aeon of Strife to the wild herds of tower defence games that roamed the plains of the Warcraft III custom map scene, Dota has always been a mongrel thing. In that sense it's appropriate that Steam's former chart-topper should spend the summer paying tribute to the genre that toppled it. 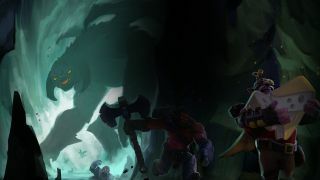 Packed in with this year's International Battle Pass is Underhollow, a team-based take on battle royale were teams race to claim a cheese from the denizens of a collapsing underground maze. Underhollow isn't pure battle royale, however. Its dungeon structure and focus on killing monsters gives it some of the qualities of a MMO raid, and the battles that take place when teams meet are pure MOBA. Think of a Dota teamfight taking place inside a WoW boss chamber on PUBG's map and you're most of the way there. Its links to the battle pass reward system aside, there's little about Underhollow that couldn't have been done by a determined map maker in Dota 2's community arcade. That said, it's all the better for Valve's resources and craftsmanship—particularly when it comes to the map and monsters monsters, which feature some of Valve's first new art for the game in months. The monsters are an all-round highlight, actually. Far from being just camps to farm for gold and experience, each room in Underhollow features a randomly-assigned encounter in one of three difficulty tiers, including boss fights. There are MMO-style tank-and-spank fights, 'the floor is lava' encounters, bullet hell wizards, invisible ghosts, and giant Wraith Kings that have to all be slain at the same time to prevent them from respawning. Figuring out each encounter is the first step, and understanding how to leverage Dota 2's vast pool of heroes to exploit them is the next. Luna's ability to bounce her glaive between lots of different foes is good in most rooms; the fact that she can't switch it off is potentially a nightmare in the room where you have to focus on hitting a big vase rather than any of the trolls standing next to it. Laudably, Valve have made the entire roster of heroes available in Underhollow and been relatively free with how monsters interact with them. They could have stacked bosses up with immunities and forced a particular playstyle, but they haven't and I think the mode is better for it. It's less balanced as a consequence, however, and while anything can work—this is Dota, after all—there are certain heroes who really love this structure. Axe, for example, thrives in multi-target encounters and is one of the rare heroes who actually becomes more dangerous when a teamfight takes place in a room that's still full of monsters. Zeus' ability to nuke every single hero on the map at the same time is a big force multiplier in Underhollow, where it can sometimes randomly ruin another team's boss battle at the push of a button. This runs the risk of turning the hero drafting step into the most important moment of the game, with many of my early matches turning into a game of 'PICK AXE'. As an Axe lifer, it's nice to see him get his moment—especially at the expense of perennial pub menace Pudge, who simply isn't very useful in the confines of the dungeon. But this degree of one-sidedness is only forgivable because Underhollow is a throwaway mode to play over the summer. If it became a bigger part of the game—and there's a case to be made for that happening—then you'd want to see something resembling balance, and that'd probably mean a cut-down hero roster. Underhollow reliably crashes for a number of players at the beginning of a match, forcing them to reconnect—this happens without fail, every single time you play, to at least a couple of people. The biggest issue, however, is stability. Underhollow reliably crashes for a number of players at the beginning of a match, forcing them to reconnect—this happens without fail, every single time you play, to at least a couple of people. Players working to meet their weekly battle points cap will quickly get used to micromanaging their disconnected teammates while they wait for them to load back into the match. There's not much else to say about this other than 'it's bad' and 'Valve should fix it'. This unreliable performance, coupled with a drive to farm battle pass points, can make Underhollow feel a little disposable—particularly when you're playing with strangers. It's really easy to throw a game away, and do so quickly, and as a consequence you're always at the mercy of your teammates. If all three of you are on the same page, great. If not, it usually means a few rooms of grinding followed by death to the first team you encounter, a trip back to the main menu, and another roll of the matchmaking dice. This feeling that Underhollow is ultimately a throwaway experience—compounded by the bugs, the imbalance, and its seasonal nature—are a shame because there's something worth exploring here: a worthy extrapolation of traditional Dota. Were it just a little bit more polished, this might have justified the cost of the Battle Pass by itself. Dota 2 is full of ways to be that guy, from spamming pings to premature GGs. In Underhollow, you can identify that guy really easily: it's the person who picks up all of the loot from a dungeon chest straight away, and then sells it without checking to see if their teammates need anything. Don't be that guy, kids!